TORONTO - Fashion Studio Magazine brings you our favourite Toronto moments captured last week on Instagram. 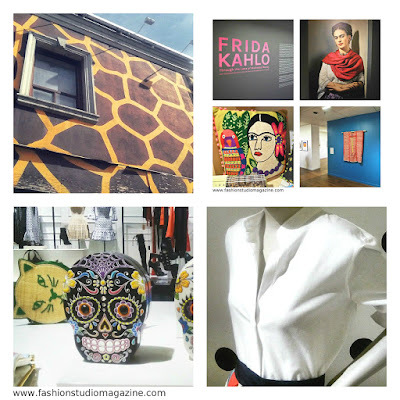 From the opening reception of Frida Kahlo exhibition to some of the hottest Spring/Summer 2015 trends from the most stylish Toronto neighbourhoods... Enjoy the pictures! Everyone is talking about Frida Kahlo this summer. Last Wednesday, Fashion Studio Magazine had the pleasure to attend the opening reception of Frida Kahlo: Through the Lens of Nickolas Muray exhibition at the Textile Museum of Canada (TMC). With live music, vibrant textiles from the Museum's collection of traditional Mexican dress, and over 50 photographic portraits of the famous artist and fashion icon - the event was definitely worth attending. Read more about the exhibition here. Don't forget to visit the Museum Shop featuring gorgeous jewellery, textiles, books, and souvenirs. Eaton Centre is one of our favourite shopping spots in the city. Centrally located, with many different retailers under one roof, it is also a great place to hang out with your girlfriends and grab something to eat (we never leave without ordering a freshly squeezed orange juice or a coffee at Starbucks). Toronto has many interesting buildings and it is always an adventure to discover something new in the city. Some hidden gems are covered with eye-catching street art, some are a unique mixture of something old and something new. Hopefully by the end of the summer our Instagram account will feature the whole selection of the beautiful city architecture. As much as we love the outdoors, we are always excited about places with unique interior design and also great food! We will be bringing you some of the most trendy bars and restaurants in Toronto in our new section 'Dining In Style' (coming soon).